When Storms hit Rockwall, Mesquite, Rowlett, and Garland, Roof Damage comes in all different shapes and sizes. Storms can pack a powerful punch on your Roof, tearing off shingles and ruining the wood decking underneath. If you have experienced Hail Damage, Wind Damage, or other Storm Damage on the roof of your home or business, call the experts at Rockwall Metal Roofing for a FREE, No Obligation, Roofing estimate! We employee only the Best Contractors in DFW and we are proud to make that statement. 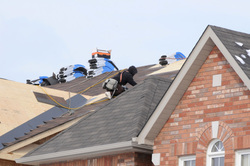 Our Skilled Contractors are Honest and Hard Working Employees that we would trust on our own roofs. After a Bad Storm, it's always good to call your Insurance Company for an adjuster or a Licensed Inspector to look at your roof. If you are seeing any of these attributes on your roof, it would be a good idea to call your Insurance Company and then call us. As well as Roof Damage, Rockwall Metal Roofing also repairs damaged siding, paint, and gutters. In high wind areas, Window Damage occurs more frequently. Whether it be wind of flying debris, be on the look out for these signs of Window Damage. If you suspect a Texas Storms may have damaged your property, whether Commercial or Residential, give us a call and we can offer your a FREE and Easy Quote.